Fuss-free, delicious and satisfying—these are just some of the reasons why small bites on skewers, particularly kushikatsu and yakitori, are hot and trending. 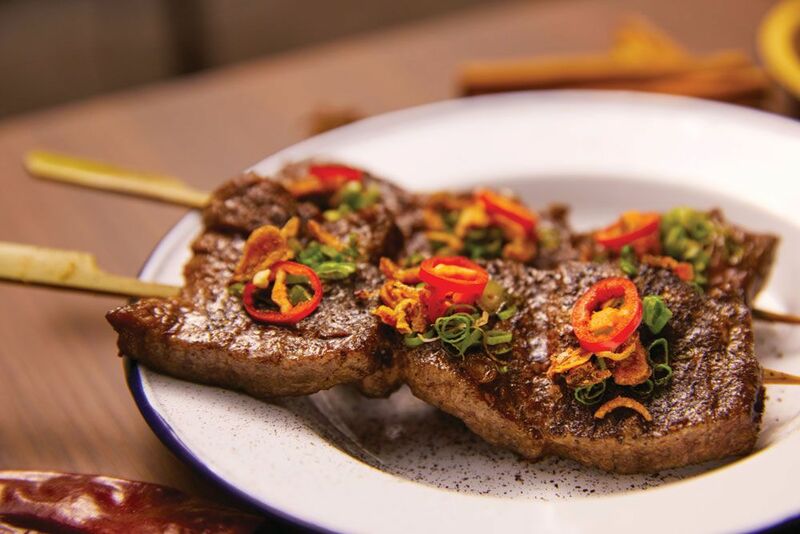 Japan’s Michelin-starred restaurant Rokukakutei (tel: 6266 1077) has opened its first outlet in Singapore and offers kushikatsu or deep-fried meat, veggie and seafood skewers. Head chef Hideyuki Tanaka recommends the omakase set, so you can try 20 premium ingredients such as angel prawn, Wagyu beef and octopus, flown in from Japan, dipped in a secret batter and deep-fried until they’re crispy, slightly golden brown and juicy. Give them a tangy lift with a squeeze of lemon juice. Chikin (tel: 6910 2742) presents an extensive menu, but it’s the chicken skewers or yakitori that will catch your attention. Chef Jeff Lee uses all parts of the poultry, even uncommon ones such as the saezuri (windpipe) sprinkled with a bit of Szechuan salt, and bonjiri (tail) and kubi (neck bone) marinated in a spicy, flavourful Szechuan mala sauce. These are cooked over binchotan charcoal, specially imported from Japan, for a smoky finish. Don’t let its cyberpunk interiors deceive you. Panko (tel: 6291 3323) makes delicious kushikatsu that can rival skewers served in other authentic restaurants. Executive chef Asai Masashi, who hails from Osaka where this dish is from, offers over 50 options. Go for the set menu if you want to try traditional specialities such as the Wagyu beef and octopus with capsicum, as well as contemporary offerings including the chewy mochi bacon with mentai (roe) mayo and Hokkaido scallop with sea urchin. Chef Makoto Deguchi, formerly of Michelin-starred Sola in Paris, now helms Birders (tel: 8748 4585) and gives traditional yakitori a modern take with his own seasoning that can be paired with specific items. Instead of using the typical shio (salt) or tare (soy-based sauce), he enhances the flavours of the classic negima (chicken thigh) with a house-made puree of finely chopped onions and a dash of mirin and sake, and the signature bonjiri with a heady garlic shoyu sauce. Chef Justin Foo’s background may be in European cooking, but his heart belongs to Asian cuisine. With Provisions (tel: 6250 7090), his new venture with co-owner and head bartender KC Rahmat, he has crafted a unique menu of claypot dishes and skewers. The latter is given a local touch with marinade made from Southeast Asian ingredients. For instance, the chicken thigh is infused with yellow curry, lemongrass and kaffir lime; the prawn’s sweetness is contrasted with turmeric and galangal; and pork jowl is given a spicy kick with Szechuan pepper.